In case you’re not a history buff (obviously we’re not talking about us), the Berlin Airlift was a response to the Berlin Blockade, during which the Soviet Union blocked access to Allied-controlled areas of Berlin at the beginning of the Cold War. The over-275,000 Allied Forces flights over the course of fifteen months dropped over 2.2 million tons of necessary supplies (e.g., food and fuel) to West Berlin and greatly embarrassed the Soviets. 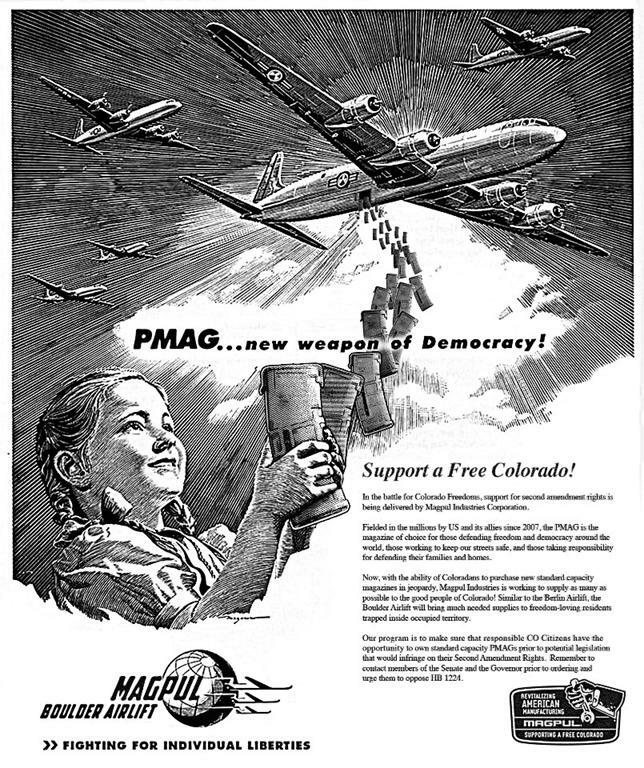 The most interesting part of this ad is that Magpul promises to create similar programs for other states that are considering this type of legislation. This is why capitalism works and government programs don’t. When a person or a company has skin in the game, they find a way to rise above adversity to thrive. Magpul has certainly made lemonade out of its legislative lemons. Kudos to Magpul Industries! « LEGISLATIVE TALKING POINTS: Will Salazar’s Unpopular Comments Reappear in Senate Hearings? North Korea's gun laws are SO sane that 80% of it's population lives in poverty. Guns give the people the power to fight the man. North Korea is a totalitarian state just like what your big government heroes are trying to do here. Stand for liberty and freedom or stand for evil and corrupt government. What? This is a nationwide movement. If you want to get away from sane gun laws, move to North Korea. Meanwhile, get out of our way. Let's hope the Colorado Legislators come to and realize they are the pawns of the Californina Liberal Express. They brought their Liberal agenda to the vacation spots of Colorado and now to the State House! I would like to be on that last flight out. This state is becoming another California, How can these politicians call themselves Americans. My Dad fought the Battle of Okinawa and would be embarassed of what a good portion of Americans have become! tell the Senate to push for enforcement of current laws ,and not turn Colorado into California. unenforceable laws are a waste of time and money, and even your vice hero says that there isn't enough money or time to enforce current laws. Common sense dictates magazine limits don't effect criminals. Tell the Colorado State Senate to vote in favor of common sense gun laws – send them a message here: URL via @DemandAPlan. I just ordered 5 30 rd Pmags. Awesome! who says we don't know how to message! Hickenlooper–TEAR DOWN THIS WALL!